We protect your home as if it were our own. Nothing's more important. A home security system protects your family and your property. It can also add to the value of your home and save you money on your home owner's insurance. Here's the process: we'll come to your home and do an evaluation of your security needs. Then we customize a system based on the unique aspects of your home, your individual needs and your primary areas of concern. Our services are full circle; we install the system and train you on how to operate it. Finally, With State-of-the-art UL Central Station Monitoring we can ensure your family has the best protection possible. With Advanced Alarm System's, the same company who installed your system will also be servicing it. It means you make one phone call for assistance, for additional training, to add or remove a user from your call list, or to add additional devices to your system. It means the company who monitors and services your system knows the person who installed it – we all share information and work together to serve you better and provide your loved ones with peace of mind. 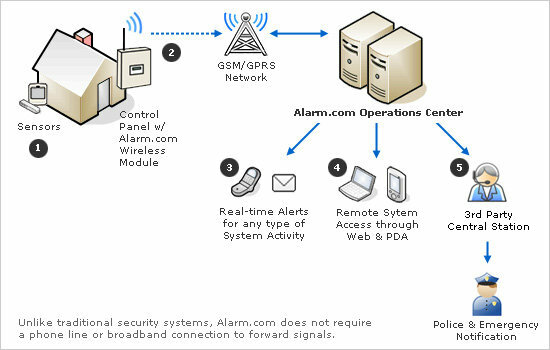 What can a complete system from Advanced Alarms do for you? Protect you and your family. Whether you are building a new home, or have an existing home and have security needs, our experts can design the right system for you. Security systems do more than deter burglars. They can also detect smoke, heat, carbon monoxide, freezing temperatures and rising water levels. We can also monitor for medical emergencies. Insurance companies commonly offer discounts of 5 - 15% when the insured premises are protected by electronic security systems. Our Systems work wirelessly with always-on GSM technology to protect your home or business 24/7, even when the power goes out. Choose Secured Wireless-enabled security systems with just the features that matter to you for an affordable security system to protect your home or business. When trouble strikes these systems are able to interact with the central monitoring station faster than traditional security systems to send out an immediate response. With Secured Monitoring, the signal from your security system travels wirelessly using a dedicated, encrypted and secure connection through a GSM cellular network. Since Secured Monitoring does not rely on a phone line or broadband connection, your security system can't be defeated by a burglar snipping the wire—no wires, no hassles. Also, with our patented "Crash and Smash" detection technology, even if an intruder locates and disables a control panel in a "crash and smash" attack, Secured Monitored Systems will still be able to send a signal to the central station for help.